Towson had its 10-player squad split between two tournaments this weekend. The team’s five seniors competed at the Bedford Cup Mid-Atlantic at the Junior Tennis Champions Center (JTCC) in College Park, Maryland, while the remaining five underclassmen competed in the Tiger Fall Classic at home. At the Bedford Cup Mid-Atlantic, all five Tigers won their first round singles matches Friday before falling in the second round the next day. In singles second round play Saturday, both of Towson’s seeded players lost in match tiebreaks. No. 21 seed Sydney Goodson of Georgetown defeated No. 12 seed Nicole Shakhnazarova 6-1, 6-7 (5), 10-3, while No. 11 seed Sofia Sualehe of Virginia Commonwealth University (VCU) beat No. 22 seed A.J. Gomer 5-7, 6-4, 10-6. The other three Towson players were eliminated by three of the top four seeds as No. 4 seed Maria Siopacha George Washington defeated Renate van Oorschodt 6-0, 6-3. No. 3 seed Diana Kussainova also of George Washington secured victory against Barbora Vasilkova 6-2, 6-2, and No. 2 seed Paola Delgado of VCU defeated Lucy Williams 6-1, 6-2. Friday, all five Towson players earned victories to advance to the second round, as No. 12 Shakhnazarova cruised past Brittanie Cahua of Coppin State 6-0, 6-0 and No. 22 Gomer topped Sara Whited of Delaware 6-2, 6-3. Van Oorschodt overcame Anna Short of Georgetown 7-6 (4), 6-2, Vasilkova rallied to win against Daphne de Chatellus of Georgetown 6-4, 4-6, 10-6, and Williams conquered Shariah Dunwell of Coppin State 6-0, 6-0. In doubles action, the No. 4-seeded pair of Shakhnazarova and Williams earned a first-round bye and went on to defeat the team of Victoria Kogan and Marie Decamps (GW) 6-2 before falling to No. 5 seeds Dylan Owens of James Madison and Noumea Witmus of VCU 6-0 in the quarterfinals. 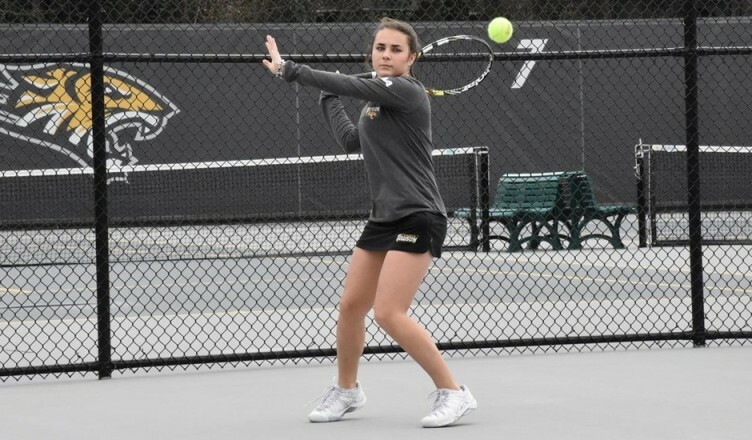 The other two teams with Towson players lost in the first round, as Jona Roka and Diane Flament (JMU) defeated the other all-Towson team of Gomer and van Oorschodt 7-6 (7). Annie Jaskulski and Draga Sabotic both of Delaware took out Vasilkova and her partner Casey Marx of Georgetown 6-3. “We’re not really match tough and we had some certain adverse conditions but that’s tennis and that’s life,” Head Coach Jamie Peterson said. At the Tiger Fall Classic Sunday, Towson earned three wins in their five matches against Saint Joseph’s. No. 1 Shakhnazarova came back to beat Amanda Nava 2-6, 6-4, 10-7, freshman and No. 4 Alexa Martinez defeated Isis Gill-Reid 6-0, 6-2, and the doubles team of Gomer and van Oorschodt beat Katherine Devlin and Iswarya Vel 6-3, 6-2. The Hawks’ Maureen Devlin held on to beat No. 2 Williams 7-5, 6-7, 10-6 and Laura Gomes defeated No. 3 Lucy Gloninger 6-3, 6-2. Saturday, the Tigers lost four matches against Morgan State, but won three against Mount St. Mary’s. The Bears took three of the four singles flights as Kayla Price defeated No. 1 Vasilkova 6-0, 6-2, Peggy Rooke beat No. 2 Shusterman 5-7, 6-4, 6-1, and Oriane Yehouenou defeated No. 4 Bedi 6-4, 6-4. Morgan State also took the doubles point, as the pair of Danielle Thompson and Asmara Faluke topped Gloninger and Francu 4-6, 6-4, 6-2. Against Mount St. Mary’s, No. 2 Gloninger defeated Hannah Davis 7-6, 6-3, No. 3 Martinez beat Megan Gamble 6-1, 6-1 and No. 4 Claire Bedi defeated Megan Smith 6-4, 6-1. Alexa Quintanilla came back to defeat No. 1 Vasilkova 3-6, 6-0, 10-5, and the team of Emma Blake and Sruthi Kamprath beat Jane Shusterman and freshman Theodora Francu 6-2, 3-6, 10-6. Friday, the Tigers opened play with three wins over Loyola (Md.). No. 2 Gloninger topped Amanda Lanciano 6-7 (5), 6-1, 6-2, No. 3 Martinez defeated Lin Robertson 6-1, 6-1, and No. 4 Bedi beat Julie Clark 3-6, 7-5, 6-4. The Greyhounds won the doubles point by default and Kateri Martin edged No. 1 Shusterman 7-5, 6-7 (5), 6-4. The team returns to competition Oct. 6, in the Blue & Gold Invitational at the United States Naval Academy in Annapolis, Maryland.